Best mates Dally and Spanky are performing at this year’s BreyerFest. A pair of super-cute, two-legged performers are expected to steal the show at this year’s model horse expo BreyerFest, and the pair will also soon be honored with their very own model. Miniature horse Spanky and Jack Russell Terrier Dally are best friends, have their own book, and have featured on TV on the David Letterman Show and National Geographic Wild. Spanky was rescued by Francesca and Steve of Rother Horsemanship, when he was just two years old. Aggressive to people and horses, Spanky wreaked havoc on everyone he met. 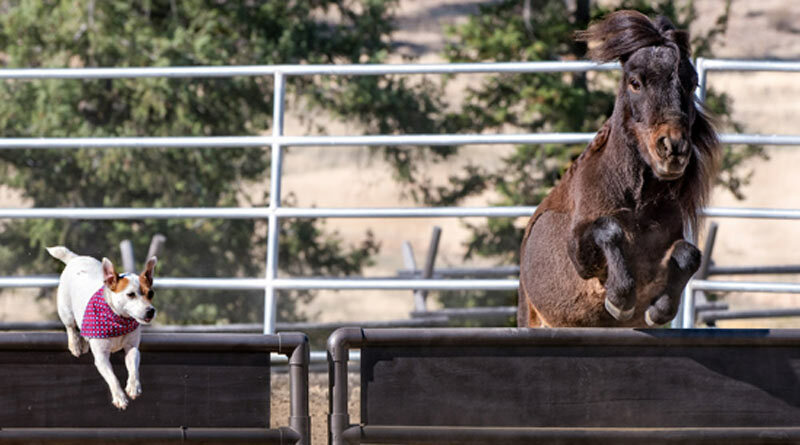 But, after a year with his new family on their ranch in Washington state, he was a changed horse … although his naughty personality stayed intact. Steve and Francesca Rother, with Jet, Spanky and Dally. Soon after, the couple brought home a new Jack Russell Terrier puppy that no-one wanted because she was the runt of the litter. They named her Dally. Dally was only six months old but every day, she would sit and watch Francesca work with Spanky on his tricks. One day, to get a better look, she hopped up onto Spanky’s back and stayed on him while he walked around the arena. Dally and Spanky love to perform together. From that day forward, they became best friends. Soon, Francesca was teaching them both tricks together. Dally and Spanky love to go over jumps, lie down and sit up together. Now, they now have a great life on the ranch and get to travel to exciting places with Francesca and Steve and their full-size horses as they give horsemanship clinics and exhibitions. In July, Dally and Spanky will be among the star attractions at BreyerFest, performing in the Celebration of Horses evening show and during the day. Their very own special model set is also to be revealed soon, according to Breyer. So A D O R A B L E !!! <3 I love happy stories about rescued animals. Wish everyone would consider saving an animal.